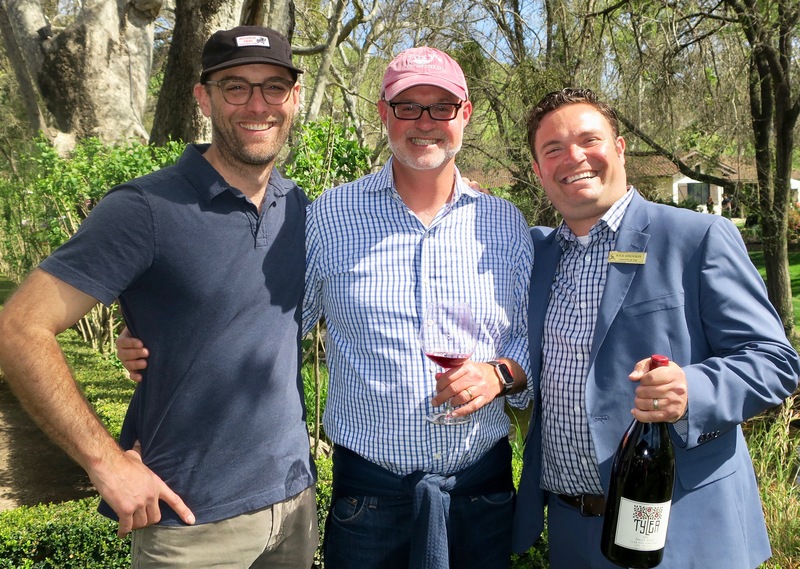 On March 30, the Santa Barbara Vintners held Wine Futures 2019, an en primeur tasting of Santa Barbara County wines held at The Alisal Guest Ranch and Resort in Solvang. The afternoon event, held under sycamore trees alongside the creek, was part of a weekend that included dinners at Alisal’s Adobe and on its oval lawn. The overall event raised about $15,000 for People Helping People’s Vinos de Sueños, which provides basic needs and support services to vineyard and farmworkers. For the nearly 300 wine enthusiasts in attendance, it was a hard-to-beat experience — tasting rare and exceptional wines and gourmet food, conversing with top winemakers and winery owners, getting a 20 percent discount on purchases, and supporting an extremely worthy cause — all in a stunningly beautiful setting. Forty wineries, including some of the region’s top names, poured 81 yet-to-be-bottled wines, some of which were rare lots available only at the event. Most wineries had their winemaker and/or owner pouring, including Hartley Ostini Hitching Post owner Gray Hartley, Brander Vineyard owner/GM Fred Brander, Sanford Winery winemaker/GM Steve Fennell, and Buttonwood Winery and Vineyard winemaker Karen Steinwachs. Gourmet food offerings paired nicely with the wines, including delectable purple sea urchin by Sea Stephanie Fish. The event was organized by Pence Vineyards & Winery GM/Santa Barbara Vintners (SBV) President Stephen Janes, Margerum Wine Company owner/Director of Winemaking Doug Margerum, Tyler Winery winemaker/SBV Boardmember Justin Willett, and Alisal’s Food and Beverage Director Kyle Erickson. This esteemed team sampled copious submissions and selected the top 81 wines as finalists. Back in 1984, Margerum created the region’s original wine futures tasting at the Wine Cask, which turned into an annual event for the next 20 years. These tastings are credited with putting Santa Barbara County wines on the map and launched brands such as Sea Smoke, Brewer-Clifton, and Tensley. Vino de Sueños (Wine of Dreams) is a brand conceived by the Santa Ynez Valley-based People Helping People (PHP) and area vintners who wanted to help vineyard and farmworkers. At an annual event held each fall, proceeds from wine sales go to PHP’s assistance programs for vineyard and farmworkers. Wine Futures 2019 donated $15,000 of the event’s proceeds to Vino de Sueños, which will provide vineyard and farmworkers with food, rent and utility assistance, and support services: counseling, high school student mentoring, parenting education, and scholarships. According to Janes, Vinos de Sueños provides much needed help for the entire agricultural community by meeting worker’s basic life needs. Janes noted that the success and quality of our agriculture is built on the backs of these workers and he was thrilled that S.B. Vintners could raise awareness and funds. PHP CEO Dean Palius shared his great appreciation for the Santa Barbara Vintners’ support, which will help PHP in its mission to make a difference in the lives of farm and vineyard workers — workers, who, according to Palius, often have to make difficult decisions about which bills to pay. Each year, PHP provides more than $250,000 in assistance to about 800 vineyard and farmworkers and their families. People Helping People’s services are not limited to vineyard and farmworkers — it provides a wide range of basic needs and support services to underserved populations in the Santa Ynez Valley, Los Alamos, and surrounding areas. Also, domestic violence prevention services and limited basic needs services are available to farmworkers in the Lompoc Valley. PHP has a current budget of $2.1 million. Last year, it served 3,850 unduplicated individuals. Santa Barbara Vintners is a nonprofit comprising industry members that protects and promotes Santa Barbara Wine Country. Next year’s Wine Futures event will be held March 27 – 29 at Alisal. For more info about Santa Barbara Vintners, go to http://sbcountywines.com. For more info about People Helping People, go to http://syvphp.org. For coverage of other events, go to independent.com/society. Send invites to gail@independent.com. Photo: Gail ArnoldGuests enjoy the tasting.